I think it is safe to say that already by this stage the principle themes of ST/LL are clear. 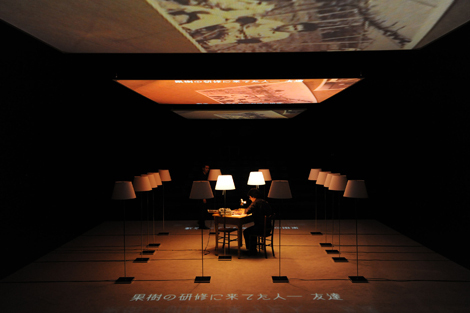 Looking back at earlier performance pieces by Takatani Shiro, the first of these, La Chambre Claire (2008), was, as the title borrowed from Roland Barthes’ theory of photography suggests, an essay inquiring into the subject of images and memory by way of photography (an exhibition with the same title was also held, and a record of the artists’ talk featuring Takatani, Sakamoto Ryuichi and myself is available at the following address for those interested in finding out more: http://www.syabi.com/contents/images/info/journal/kiyou_14/10.pdf). The second, CHROMA (2012), was, also as the title suggests, an essay inquiring in particular into the subject of color and its perception (an additional line leading from Ludwig Wittgenstein to Derek Jarman was also drawn, although this could also be connected to Takatani’s mentor, Dumb Type’s Furuhashi Teiji). 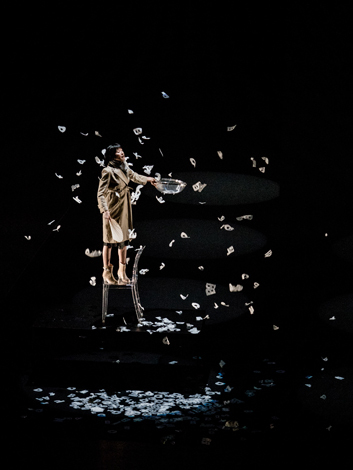 Likewise, in Takatani’s third performance piece, ST/LL, the question of how spatial/temporal (and perhaps even higher dimensional) depth can appear, and also disappear, from a plane with no depth – a reflective water surface filled with, to borrow a phrase Miyakawa Atsushi used in reference to a mirror, a “bottomless lack of depth” – and the question of how complex phenomena can appear, and also be scattered and lost, from a minute fluctuation like the initial ripple, are examined using multimedia. * Yes, the “/” in the title ST/LL is none other than the ripple on a surface of water, or what the likes of Epicurus and Lucretius referred to as a “Clinamen,” being the slight deviation added to the trajectory of atoms that according to the teachings of Democritus ought to fall straight down. As hinted at in the brief text (by Alfred Birnbaum) read out in a later scene, in this world of fluctuation, even things that appeared to be clear cause-and-effect will probably turn out to be nothing but statistical correlation (“coincidence”) (this is both a question posed by philosophy from Hume to Meillassoux, and a question posed by quantum mechanics). However, let there be no misunderstanding. ST/LL plays out above all as a trick of pure light and sound. When the audience’s eyes and ears, or should I say their brains, are awash with the lighting and visuals, which are sharp yet restrained and deployed with almost perfect timing (yes, in performance, timing is everything), and with the sound, they have no time to think, and no need to. After the show is over, when I try to summon memories of the beautiful, daydream-like performance while unconsciously gazing out at the surface of wintry Lake Biwa from the hall lobby, bookish arguments like the one I have just described simply cross my mind. At the risk of exaggerating, one could even say ST/LL is almost completely lacking in anything resembling content. Devoid of anything like meaning or a message, it has a purely emotional effect of the kind that leaves one unsure of what it is one is being moved by – this is the subtle effect of the performance called ST/LL. And surely this more than anything is what should be called the ultimate achievement of a performing art. Of course, this is a somewhat exaggerated argument, since ST/LL is not completely devoid of content. 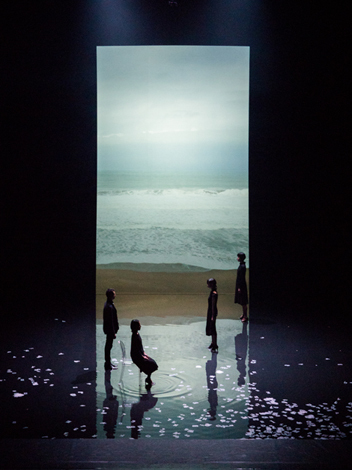 The room flooded with water could be said to be a minimalistically refined version of Tarkovsky’s imagery (the nucleus of one of the collaborations between Takatani Shiro and Sakamoto Ryuichi, who was the Artistic Director of Yamaguchi Center for Arts and Media’s 10th Anniversary Program in 2013), while the imagery of a reflective water surface calls to mind similar imagery in “Hérodiade” and other poems by Stéphane Mallarmé [which Takatani brilliantly visualized as part of the Mallarmé Project led by Watanabe Moriaki (2010–12 at the Shunju-za theater at Kyoto University of Art and Design)]. The scanning line that lines up with the Spidercam and sweeps across the stage with a sharp pulsing sound has been used as a theme with a mind to the surveillance society since around the time of Dumb Type’s OR. Meanwhile, following Birnbaum’s text, Tsuruta Mayu reads the Ainu lullaby “60 cradles,” which leads to a recital (recorded) by Kawakami Yoko, and the part where a 6×10 grid of electric lamps descends to a height of less then a meter and shines as if following her as she walks is truly beautiful. It should be clear that Takatani’s findings at the Sapporo International Art Festival, where he again played a vital role under Guest Director Sakamoto Ryuichi, led here. And yet at the same time there is the consummate playfulness of the scene, harking back to the telephone game in Chambre Claire and the monster in CHROMA, in which Yabuuchi Misako, playing two (or is it three?) parts at the same time, recites a narrative in an unidentifiable language that is not even Ainu. It is almost as if communication with others is not the issue. “I” am already a crowd of strangers, and the solitude of the lone “I” is a “crowded solitude” (Baudelaire-Deleuze). It is the kind of virtuoso performance of which Yabuuchi alone is capable, grounded in her experience in elderly care but also extending a line from there to a place beyond the confines of halfhearted humanism. Eventually, after some difficulty, she climbs on top of a table and scatters about from a basket all kinds of letters, though these are never deciphered. 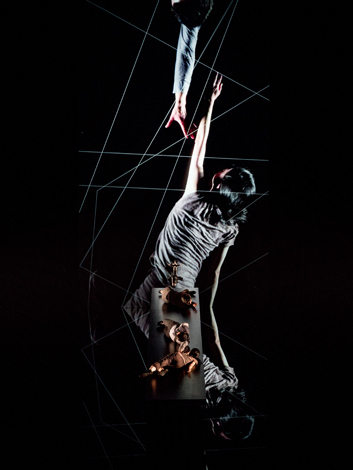 Then, in the next scene, in a segment so beautiful it is breathtaking, after a total solar eclipse, Hirai Yuko dances on the water while bathed in cool HMI light that filters in obliquely through fog, and the Spidercam also stops taking video, turning into a robot whose purpose is unclear and aimlessly dancing in circles around the dancer who has fallen flat on the water. That’s right, to reiterate, it is in the way in which in each scene, before the meaning looks like it is about to congeal, the surface of the water stirs and the performance casually flows into the next scene that the refinement of ST/LL lies, and ultimately this leads to the abandonment of not only words but also images. 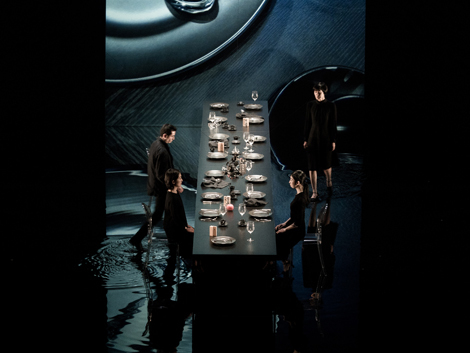 Later, ST/LL returns to the beginning, finishing with the performers repeating the initial movements without the table in front of a screen on which is projected a scene of a water’s edge (although in front of the audience at a distance of a few dozen meters is a real water’s edge) – as if everything until then had been a fleeting dream. As indicated by the title, it is above all a tranquil ending. As is clear from this account, it should be added that Sakamoto Ryuichi, who provided the music for ST/LL, played a crucially important role in this work. Despite being involved in preparations for the 2014 Sapporo International Art Festival as Guest Director, the musician, who was unable to leave New York because he was receiving urgent medical treatment, kept in close contact with Takatani Shiro, listening to his ideas for ST/LL and creating the music. For example, the low, monophonic piano tune that accompanies the high frequency ringing (which is restrained and by no means harsh) at the beginning. Particularly in light of the fact that Sakamoto Ryuichi, who was responsible for the music in Alejandro González Iñárritu’s The Revenant, rated highly the music in Iñárritu’s previous film, Birdman, one is reminded of the piano melody at the start of the third movement of Ravel’s Piano Trio, an adapted version of which featured in that film – although the melody itself is more reminiscent of the Dawn passage in Daphnis et Chloé arranged in the style of Satie. Also, the sounds akin to an abstraction of ceremonial court music that build in an atmosphere filled with subtle tension in the scene with the dancer and the Spidercam in the fog before this same tune is repeated in the final scene. With credit also due to the skills of Minami Takuya and Hara Marihiko, who took the material provided by Sakamoto Ryuichi and carefully tailored it to the performance, one could probably say that the music in ST/LL played perfectly the role of filling a performance that was already infused with a tranquil beauty with a relentless yet subdued tension. 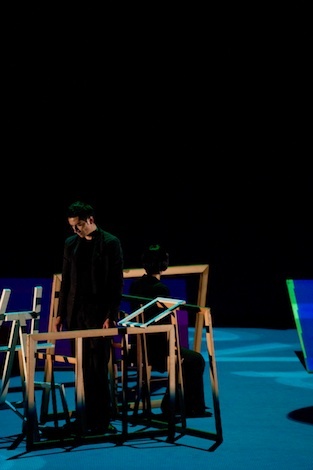 Here, looking back somewhat abruptly, it is interesting to note that the final appearance in Japan by the Tanztheater Wuppertal under Pina Bausch herself was a 2008 performance of Vollmond (Full Moon) at the Biwako Hall (the Tanztheater Wuppertal, which continues to stage performances even following Bausch’s sudden death in 2009, returned to Biwako Hall in 2010 to perform Komm tanz mit mir (Come Dance With Me), on which occasion Kusuta Eriko and I presented a talk remembering Pina Bausch). Rain was made to fall on the stage via equipment that heated and circulated as many as 25 tonnes of water, and the dancers sent up sprays of water as they danced without reserve. A part of this overwhelming performance can be seen in the movie Pina, directed by Win Wenders and completed after Bausch’s death, but compared to the incredibly vivid memory I have of experiencing the water feast that is Vollmond live at that beautiful lakeside theater, the movie looks like little more than a poor replica. 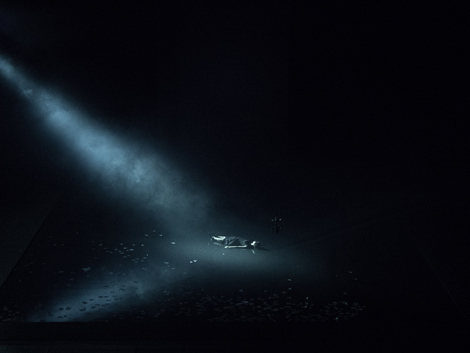 ST/LL premiered at Le Havre in France, so I should probably avoid farfetched interpretations, but considering that Takatani Shiro was also in the audience at that performance of Vollmond at Biwako Hall, it is tempting to view ST/LL as a distant envoi to that work. In ST/LL, the water that danced boisterously across the entire stage in Vollmond appears frozen like a mirror. However, the faint ripples that form there describe a surprisingly complex pattern due to their mutual interference, and even after they disappear without a trace they leave in the minds of viewers a subtle impression – not the infra-red impression of Pina Bausch or the ultra-violent impression of William Forsythe, but a zero-degree impression, as it were, an impression that is relentlessly transparent. This essay is an expanded version of views expressed off the cuff at an artists’ talk following a performance of ST/LL on January 23 at which I acted as the moderator. I would like to thank the participants: Takatani Shiro performers Tsuruta Mayu, Hirai Yuko and Yabuuchi Misako; Hara Marihiko, who was responsible for the music; and Furudate Ken, who was responsible for the media authoring. *Apparently there was some discussion on the Internet concerning reports that I had “dissed teamLab and Rhizomatiks” at the start of the talk, but of course what I was addressing were not the merits of any particular artist or group of artists. It is precisely attempts to question through media issues fundamental to media that are worthy of the title media art, while simply lending amusement to something with effects that make free use of new media cannot be called media art. That is all I wanted to say.